Journal of Comprehensive Pediatrics - Management of Fetal Ectopic Atrial Tachycardia: What is the Best Decision? To Cite: Aghaei Moghadam E, Ghamari A, Nikoufar M. Management of Fetal Ectopic Atrial Tachycardia: What is the Best Decision?, J Compr Ped. 2018 ; 9(1):e57734. doi: 10.5812/compreped.57734. The prevalence of fetal arrhythmia is about 1% to 3% of all pregnancies and they are mostly benign. This report describes fetal ectopic atrial tachycardia (EAT) diagnosed in 31 weeks of gestation. The arrhythmia did not respond to transplacental therapy; therefore, cesarean section was done and arrhythmia was controlled by propranolol. 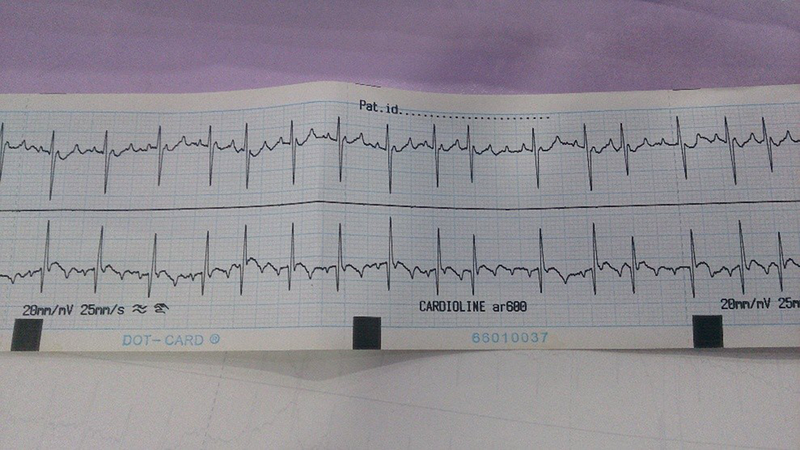 This case showed effectiveness of rate control strategy by administration of propranolol. The prevalence of fetal arrhythmia is about 1% to 3% of all pregnancies and they are mostly benign (1, 2). Ectopic atrial tachycardia (EAT) is caused by abnormal ectopic focus locating in atria or great veins, acts as the pace maker and creates pulses faster than sinus node (3, 4). A 29 - year - old pregnant female, gravida 2, para 1 at the 31st week of gestation referred to the under study clinic due to fetal dysrhythmia. The patient had no history of abortion and febrile illness, smoking, or caffeine intake during pregnancy, and taking drugs except prenatal vitamins; also, there was no history of thyroid dysfunction. 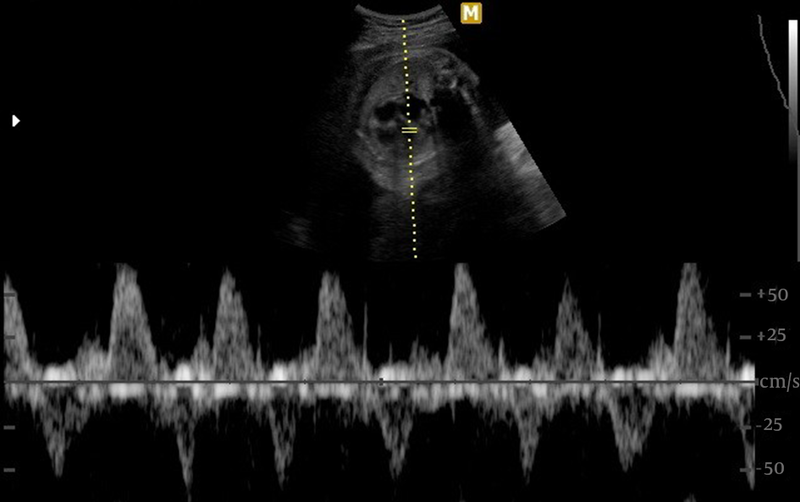 Fetal echocardiography revealed supraventricular tachyarrhythmia with a ventricular heart rate of about 214 bpm and atrial heart rate of 237 bpm and some degree of atrioventricular (AV) block (Figure 1). It also demonstrated an augmentation of amniotic fluid, a mild pericardial effusion and mild tricuspid regurgitation (TR) in favor of beginning of hydrops fetalis, but cardiac structure was normal. Based upon these findings, the diagnosis of atrial flutter or atrial tachycardia was made. The patient was admitted due to incessant nature of arrhythmia. At first, it was decided to convert fetal tachyarrhythmia with maternal administration of sotalol. The patient received 80 mg sotalol 3 times a day, orally but after 36 hours there was no change in fetal heart rate and it seemed that sotalol failed to control the rate of the fetus. Therefore, it was decided to change to amiodarone intravenously starting from 1600 mg per day and reaching 2400 mg per day after 7 days of administration. But, the fetal tachyarrhythmia persisted and fetal echocardiography demonstrated further augmentation of amniotic fluid and pericardial effusion after the administration of amiodarone. According to the pregnancy age and weight termination was advised. Therefore, the infant was born by cesarean section in the 33rd week of gestation with a birth weight of 3100 g (showing larger size for gestational age regarding the fluid accumulation from fetal hydrops) without complications, with normal Apgar score (at 1 and 5 minutes) and without the need for resuscitation. There was no sign of hyaline membrane disease (HMD). Routine neonatal care including antibiotics and O2 therapy were administered; the thyroid function tests were within normal values after birth. The new born was admitted to neonatal intensive care unit and electrocardiogram after birth revealed ongoing AT with ventricular rate of approximately 150 bpm and atrial rate of about 300 bpm with variable AV block (Figure 2). Propranolol 1 mg/kg per day was administrated through nasogastric (NG) tube in order to control the heart rate of the patient. The latter electrocardiogram revealed decreasing ventricular respond to 120 - 140 bpm manifesting the drug effectiveness, and finally arrhythmia resolved spontaneously after 2 days of therapy due to its benign nature. The prevalence of fetal arrhythmia is about 1% to 3% of all pregnancies and they are mostly benign (1, 2). The most common types of these arrhythmias are ectopic premature atrial contractions (PACs) diagnosed by fetal auscultation from 18 weeks till the labor. The mostly diagnosed tachyarrhythmias are supraventricular tachycardia and atrial flutter and the mostly diagnosed bradyarhythmias are sinus bradycardia caused by second - degree AV block and complete heart block (1, 2, 5). EAT is caused by an abnormal ectopic focus locating in atria or great veins, acts as the pace maker, and creates pulses faster than sinus node (3, 4). Rapid depolarization of action potential during phase 4 or micro entrants are assumed to be responsible for its generation. Heart rates are usually high and P wave morphology could be different based on ectopic focus location. According to mechanism of its generation, vagal and AV nodal suppression have no effect on terminating the arrhythmia .Treatment in postnatal patients is difficult and if the arrhythmia persists and becomes permanent, heart failure occurs as a result (3). To the authors’ best knowledge, fetal EAT is rare and a few cases of fetal EAT are reported. Various antiarrhythmic drugs are used for transplacental treatment of the arrhythmia. The drugs are limited due to the side effects in the mother and also in the fetus. There are different experiences with drug effectiveness. L. B. Van der Heijden in a study determined the efficacy of sotalol for fetal tachyarrhythmia. They studied 28 cases (18 with supraventricular tachycardia and 10 with AF) that 6 of them were hydropic. All of the patients were treated with sotalol as the first - line therapy. It was reported that all hydropic cases converted to sinus rhythm and among non - hydropic ones, 91% converted to normal sinus rhythm and in 9% rate control was achieved. Eventually, this study concluded that sotalol could be an appropriate choice for first - line therapy (6). In the current study, the patient was treated by sotalol at first, but there was not improvement in clinical and paraclinical situations after 36 hours. Another study was conducted by Jean - Marie Jouannic on the efficacy of amiodarone as the second - line therapy for fetal arrhythmia. Their study included 26 fetuses with supraventricular tachyarrhythmia that were all hydropic and all of them were treated with digoxin alone or in association with sotalol as the first - line therapy. SVT persisted in 10 cases after the first - line therapy and 9 of them received Amiodarone alone or with digoxin as the second-line therapy; eventually, five of them converted to normal sinus rhythm after the administration of amiodarone (7). Another study was conducted by Stambach including 19 neonates diagnosed EAT with median age of 18 days; 10 patients had permanent EAT and 9 had paroxysmal EAT, and severe cardiomyopathy occurred in 2 of the patients. It was demonstrated that therapy with class IC and III antiarrhythmic drugs can completely cure the arrhythmia (8). Mehta AV showed the efficacy of propranolol to treat the EAT. They considered 10 infants with median age of 6 months with EAT; 5 of them received a dose of intravenous propranolol at the beginning followed by oral propranolol and 5 patients received oral propranolol alone. Among the patients that received a single dose of intravenous (IV) drug at first, and the ones that did not, 3 and 2 subjects converted to normal sinus rhythm, respectively. It was demonstrated that 5 of the 10 patients responded appropriately to the oral propranolol (9). Knudson reported a case of neonatal EAT. The definite diagnosis was made at the age of 3 days following a paroxysmal tachycardia with the rate of 240 that was resistant to vagal maneuvers. They tried multiple antiarrhythmic regimens, but their patient responded to the combination of amiodarone and propranolol (10). In the current study, the rate control was achieved with propranolol after birth. Therefore, regarding sotalol and amiodarone failure of success in prenatal rate control, it was assumed that the prenatal propranolol administration could lead to rate control. 1. Strasburger JF. Fetal arrhythmias. Prog Pediatr Cardiol. 2000;11(1):1-17. [PubMed: 10822185]. 2. Ferrer P. Fetal arrhythmias. Current concepts in diagnosis and treatment of arrhythmias in infants and children. In: Deal B, Wolff GS, Gelband H, editors. Armonk (NY): Futura Publishing Company, Inc; 1998. p. 17-63. 3. Goldreyer BN, Gallagher JJ, Damato AN. The electrophysiologic demonstration of atrial ectopic tachycardia in man. Am Heart J. 1973;85(2):205-15. doi: 10.1016/0002-8703(73)90462-6. 4. Gillette PC, Garson AJ. Electrophysiologic and pharmacologic characteristics of automatic ectopic atrial tachycardia. Circulation. 1977;56(4 Pt 1):571-5. [PubMed: 902384]. 5. Allan LD, Hornberger LK, Sharland GK. Textbook of fetal cardiology. London: Greenwich Medical Media Limited; 2000. 6. van der Heijden LB, Oudijk MA, Manten GT, ter Heide H, Pistorius L, Freund MW. Sotalol as first-line treatment for fetal tachycardia and neonatal follow-up. Ultrasound Obstet Gynecol. 2013;42(3):285-93. doi: 10.1002/uog.12390. [PubMed: 23303470]. 7. Jouannic JM, Delahaye S, Fermont L, Le Bidois J, Villain E, Dumez Y, et al. Fetal supraventricular tachycardia: a role for amiodarone as second-line therapy? Prenat Diagn. 2003;23(2):152-6. doi: 10.1002/pd.542. [PubMed: 12575024]. 8. Stambach D, Bernet V, Bauersfeld U. Clinical recognition and treatment of atrial ectopic tachycardia in newborns. Swiss Med Wkly. 2007;137(27-28):402-6. 9. Mehta AV, Sanchez GR, Sacks EJ, Casta A, Dunn JM, Donner RM. Ectopic automatic atrial tachycardia in children: clinical characteristics, management and follow-up. J Am Coll Cardiol. 1988;11(2):379-85. [PubMed: 3339178]. 10. Knudson JM, Kleinman CS, Copel JA, Rosenfeld LE. Ectopic atrial tachycardia in utero. Obstet Gynecol. 1994;84(4 Pt 2):686-9. [PubMed: 9205449].